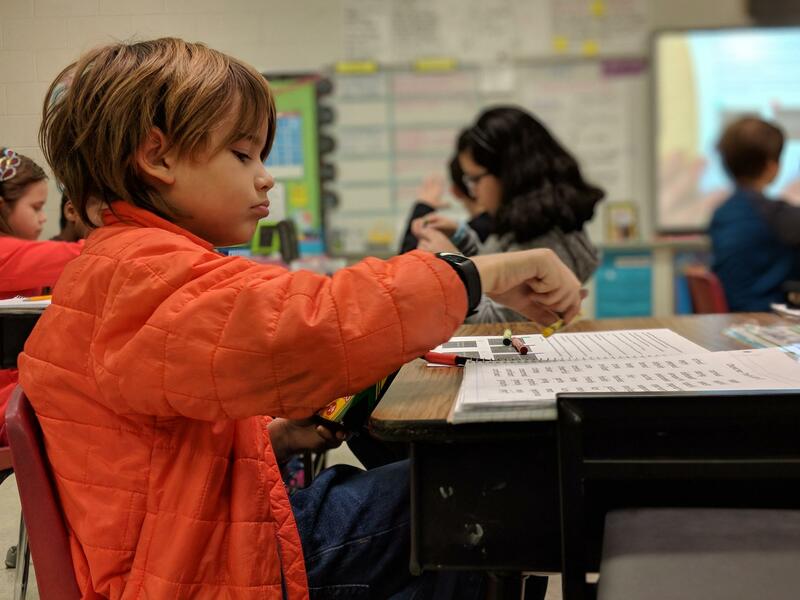 Third grader Dylan Ward's big personality disguises the fact that he is in the middle of an academic year that can be especially stressful for kids, parents, and teachers. Lisa Philip reports on the importance of third grade, an academic year that can be especially stressful for kids, parents, and teachers. The shaggy-haired nine-year-old says he has a lot of friends inside and out of his classroom at Marvin B. Smith Elementary School in Burlington, and that they are a healthy mix of boys and girls. What does he think of girls? Given Dylan’s sheer bravado, it’s hard to tell he is in the middle of an academic year that can be especially stressful for kids, parents and teachers. One of the main reasons for this: third grade is the first year students in North Carolina are given standardized tests. Students’ reading skills in particular are thrown into the spotlight. A study published by the Annie E. Casey Foundation in 2011 of 4,000 kids born over the course of a decade found that kids who couldn’t read as third graders were four times more likely to drop out of high school. 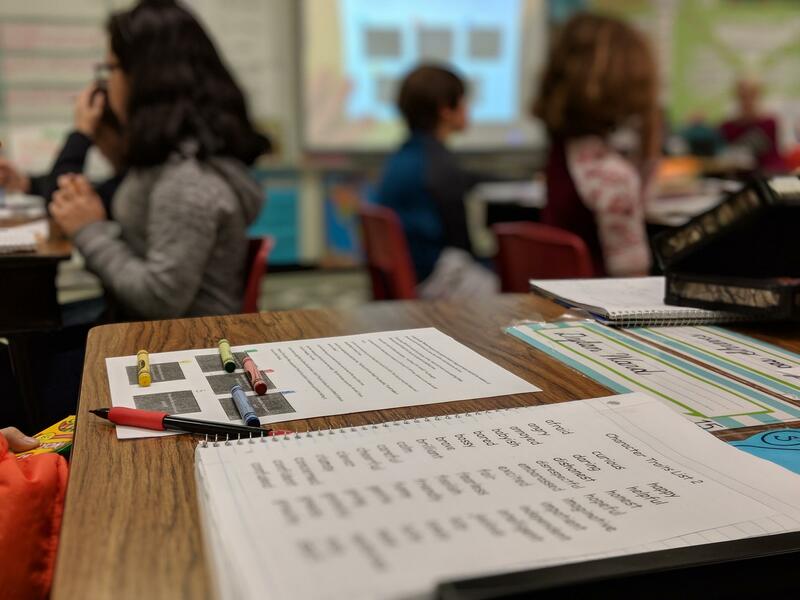 A list of character traits that third grader Dylan Ward is working on identifying in reading passages in his classroom at Marvin B. Smith Elementary School in Burlington. These results are quoted constantly by educators, child advocates, and politicians when talking about education reform. But they don’t seem to be a big concern for Dylan’s mom, Chelsea Ward. 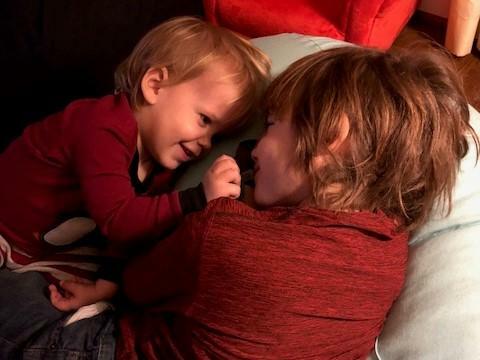 At this age, Dylan is becoming “his own little person,” Ward said. As a third grader, Dylan’s become more responsible, his mom said, about his schoolwork, but about other things, too. Third grader Dylan Ward (right) with his little brother. His mom, Chelsea, says at age 9 Dylan has become more responsible -- about his schoolwork, but also about tasks like caring for his younger siblings. 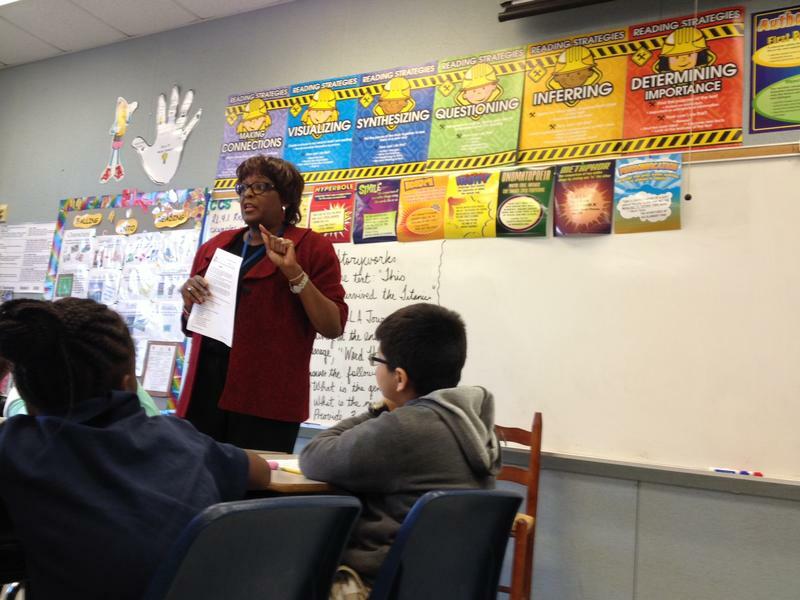 Ward said Dylan takes pleasure in this responsibility, which is common for third graders. By this point, children are often excited to be independent with a lot of different tasks, according to Katherine MacDonald, a Goldsboro pediatrician and mother of three. In other words, she said, they are more self-sufficient. She said before that, some kids may not have the fine motor skills to accomplish these tasks on their own. 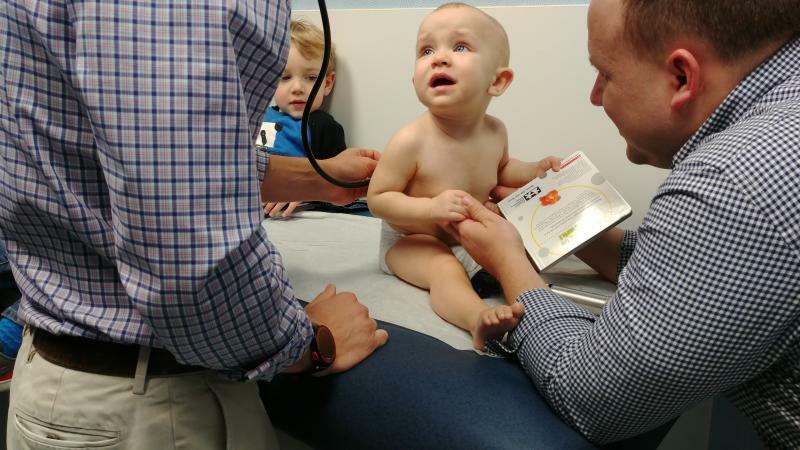 That gets at an important point in all this -- one that parents hear repeatedly from their pediatricians and from baby books: that there is a huge range within any one grade level of children. “You’re going to have kids that can read high school-level novels in third grade. And you’re going to have children who can’t read at all in third grade,” said Adam Holland, a researcher at the Frank Porter Graham Child Development Institute in Chapel Hill. Most third graders in North Carolina must now prove they can read well before being fully promoted to the fourth grade. Legislators enacted the policy in 2012. 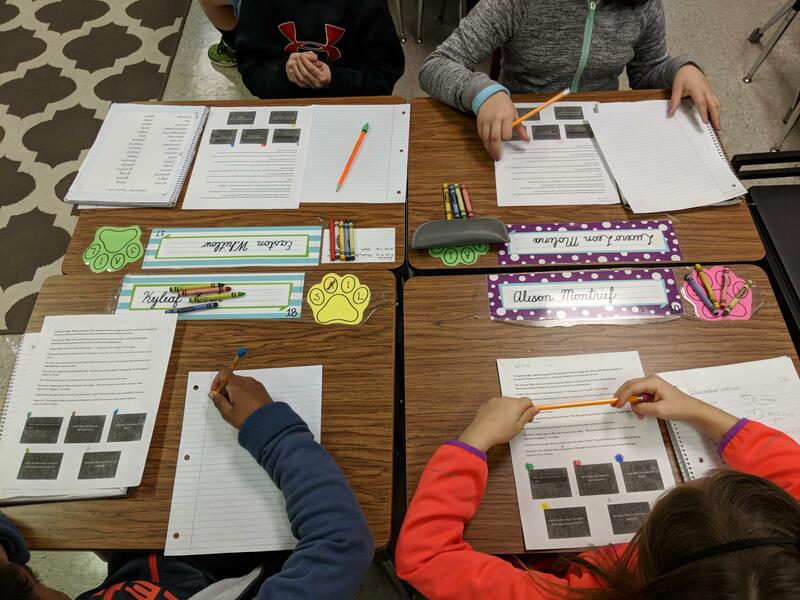 A group of third graders in a classroom at Marvin B. Smith Elementary School in Burlington work on literacy exercises. They must prove they can read on grade level before being fully promoted to fourth grade. Dylan, for one, doesn’t have to worry about this. He just met certain reading benchmarks that guarantee he won’t be held back. That’s in spite of his dislike of reading, but perhaps because of the type of environment he’s been raised in. His mom is a doctor and his dad an analyst. There are books on every floor of his family’s three-story house. And Dylan’s mom often has him read to his younger brother and sister. But for some of Dylan’s peers, whose families may not have bedtime reading or even books, learning to read on grade level could prove overwhelming. Lisa Philip reports on an early literacy program that give books to kids at each of their regular checkups, from the time they are six months to five years of age. Sometimes Dr. David Tayloe’s patients are less than thrilled to see him. Take two-year-old Kenai. When Tayloe walks into the room and says hello, the toddler whimpers. Third-graders usually can’t be counted on to remember important dates, other than their birthday. But third-grader Antonio knows the exact dates of his end-of-grade tests, or EOGs.